A Ukulele Version is also available. Useful for beginners of all ages. Beginner Guitar students of any age group. 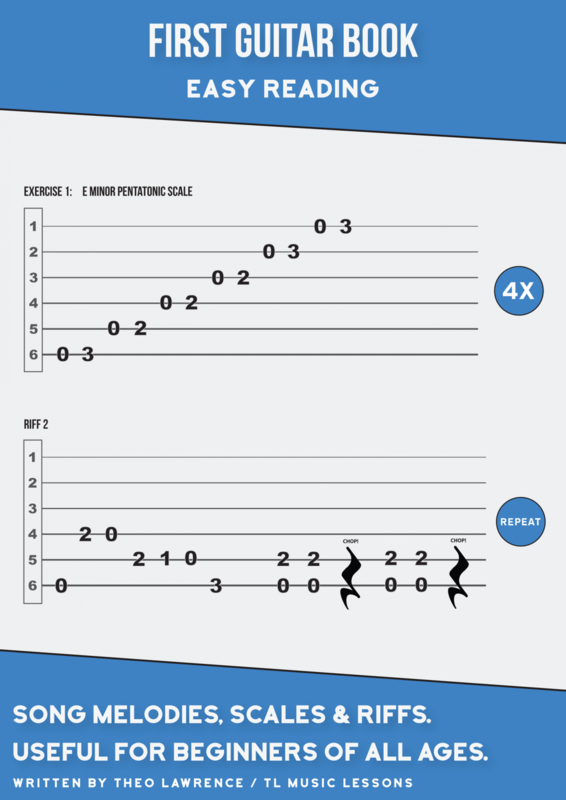 Guitar teachers can print the book or single sheets for their students and teach it to them. Get used to the basics with this easy to read book before moving onto standard tab and notation. Parents may be able to teach their children with this book. Some may be able to teach themselves the basics with this book. This easy reading ebook is a compilation of 9 years teaching guitar and preparing lesson sheets for my students. I developed the easy reading design for complete beginners. It is based on normal guitar tab, but simplifies it so that there are no distractions, and it’s huge and easy to look at rather than the numbers being small. I tested some of these sheets over the last 6 months until I was ready to create the rest of the book. I have found that the format that I have created takes away any unnecessary distractions in order to teach the basics without distractions and confusion. I believe it solves problems with reading the music for beginners of any age, but particularly for young beginners. I decided to create this range of sheets like this one to make both my life easier and to help my students get to grips with reading tab quicker for playing scales, melodies, public domain songs, traditional songs and riffs. I have created the sheets using Adobe Illustrator. There are different ways of playing the scales so it’s ok to do what works for you but don’t just use 1 finger for all of it! Younger players think it’s faster at first, but it’s really not in the long run. If you have frets 1 2 3 and 4 to play in an exercise, you could use all 4 fingers to play it (1st, 2nd, 3rd and 4th finger). Use this technique of ‘one finger per fret’ where it seems comfortable to do so. If a scale only has 0, 2 and 3 in it, then you could use just your strongest 2 fingers to play it (1st finger for the fret 2’s and 2nd finger for the fret 3’s). Guitar teachers can use this ebook in their own teaching and they are welcome to print physical copies for their students.